Priscilla Thorn's heart broke when her son killed his wife and now shatters when her son takes his own life. Priscilla's grief-stricken soul finds little comfort knowing before he died, Samuel turned his life over to God. Priscilla believes for Samuel to receive forgiveness from the Heavenly Father, she must give it to Samuel's earthly father...her abusive ex-husband. Edgar Fritz is stunned when the woman he loves takes her dying ex-husband into her home. While Priscilla sees caring for her ex-husband as showing God's love, Edgar believes Stephen will use the opportunity for revenge. Edgar risks losing Priscilla's friendship by insisting the man hasn't changed his ways and has come back to hurt her one last time. Is Priscilla risking her life by insisting her ex-husband changed so the world -- and God -- will know her son had changed? 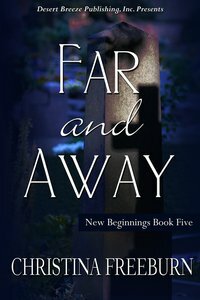 About "Far and Away (#05 in New Beginnings Series)"
Since Christina can remember, books have been one of her loves. There was nothing better than picking up a story and finding herslef in a new place and greeting new friends or becoming reacquainted with old ones. In the ninth grade, she and a friend decidd to write a teenage romance together. The friend lost interest but it was the start of a lifelong passion and dream for her. She served as a legal specialist at J.A.G. of the US Army and has also worked as a paralegal, a librarian, and a church secretary. Previously, she had three mystery novels published. Her first novel, /Parental Source/, was 2003 Library of Virginia Literary Award nominee. Christina writes inspirational romantic suspense novels that feature heroines and heroes willing to risk their lives in order to find their hope, promise and a future in a world set to destroy them. When a client's privacy is threatened by a Hatfield and McCoy battle erupting, skip-tracer Danita Ballinger heads to Mourning, WV, hoping to settle the feud before it starts. Danita's rescuing is seen as interference and improper by Pastor Riley Coole, the target for the mining company's strong-arm tactics. Pastor Riley Coole isn't pleased by the person his uncle hired to 'help' the town. The outspoken, brazen young woman isn't who they need. Riley prefers the calm approach to dealing with the mining company not a fight fire-with-fire plan. When a murderer targets the key players in the mining war, and retaliation is set into motion, Danita and Riley must put aside their private battle to protect the people relying on them for safety. Will seeing each other in a new light put them on a path of acceptance and true love, or create a further divide ripping apart the town and their own hearts? Skip-tracer Renee Stratford-Knight's life is becoming stable again. Eighteen months prior, the murder of her sister and the soon-to-follow collapse of her marriage left her reeling. She made it through those dark days with the help of family, embracing faith and starting her own skip-tracing business, New Beginnings, which specializes in relocating abused women. Now, her ex-husband -- and former business partner -- Jonas Knight shows up asking about her most vulnerable client. Jonas knows his ex-wife helped embezzler Gina Howard elude the authorities and plans to bring the young woman to justice. When Renee is threatened, Jonas grows suspicious of his client's reason for finding his niece. In order to uncover the secrets their clients hold, Jonas and Renee must struggle through distrust and the pain of their pasts to work together to save the life of a teenage girl -- and their own.